Outdoor Lighting Perspectives franchise business opportunity. Free Outdoor Lighting Perspectives business franchise information. Building financial independence for your family and the freedom to build a business as large as your dedication and work ethic will allow. Do you like the idea of making something of beauty even more magnificent? Do you like the idea of not packing up to move to a strange, unfamiliar place again? 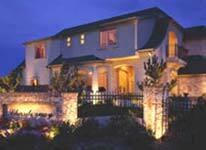 Outdoor Lighting Perspectives, (OLP), is a comprehensive provider of low voltage, high-end architectural and landscape lighting systems. The target market is affluent homeowners and trade professionals. International in scope, OLP has enjoyed sustained growth since its inception. There are many opportunities for ownership in our franchise system as OLP maintains a strong commitment to corporate and individual franchisee success. Like all successful franchise systems, OLP enjoys a strong market position within our industry/category. OLP is not complacent about being the "Nation's Largest Landscape and Architectural Lighting Company." Our niche is recognized as one of the leading after-market growth opportunities in the "Green Industry." And, our name recognition ranks high amongst prospective buyers of our services. Sales Training: As your ultimate success will be reliant upon your ability to interface with prospects and provide a compelling sales presentation, OLP considers it vital that you have the best sales training available to you. OLP is under contract with a leading national sales training organization. Working in tandem with them you will learn the techniques that will be invaluable to your long-term prosperity. Annual Franchisee Conference/Annual Sales Incentive Trip: OLP hosts an annual meeting which brings together owners of our growing franchise system. The range of subjects includes industry trends, product advancements & R&D, sales and marketing success stories, business management tactics and training/coaching clinics. The Annual Meeting always produces actionable strategies for a franchisee's continued growth. After the annual conference, it's off to a sunny resort or cruise for some relaxation. All franchisees are assigned an annual sales quota. If that sales amount is met, that franchise owner and one other person are invited to join the OLP Headquarters staff and B & B Manufacturing on a 4 - 5 day trip. Most expenses are paid for, so all the franchisees have to do is have some fun in the sun! 3 Regional Conferences Yearly: Held during the middle of the year and at 3 different regional locations, we get together to brainstorm for ideas regarding National Advertising Fund expenditures. This time is spent getting a feel for what the franchise owners see a need for in their respective markets and what the system needs as a whole. A great deal of the ideas shared will be implemented and executed in some form or fashion during the following year. Database Management & Accounting Software: OLP makes available the most beneficial and easy-to-implement accounting and database management systems possible. Through a sound and secure web site, we are able to provide assistance in the set-up and maintenance of these programs. Should you commence with the purchase of an OLP Franchise, you will receive personal training and hands-on help reviewing your database and accounting software options. To learn more about the Outdoor Lighting Perspectives franchise opportunity, simply complete the form below.